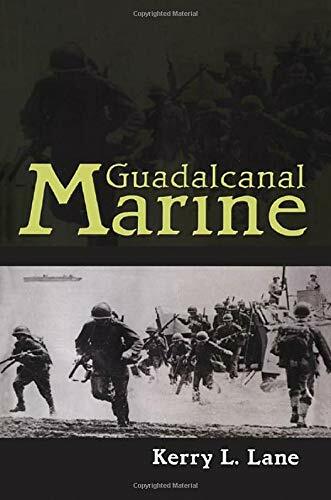 In Guadalcanal Marine, Kerry L. Lane recounts the dark reality of combat experienced by the men of the 1st Marine Division fighting on Guadalcanal and Cape Gloucester. With eighty gripping photographs and his text, he brings to life the struggles of his companions as they achieve these two astonishing victories. Lane, a sixteen-year-old farm boy from North Carolina, battled the Japanese and rose to heroism powering a bulldozer to bridge ""Suicide Creek"" in the swamps on Cape Gloucester. There he led his Marine comrades to victory. Lane describes the trials of the common Marine serving in the first grueling island campaign. In vivid prose he tells of joining the service before the war and of training. Soon after the shocking news of Pearl Harbor, he and his trusted comrades fight the Japanese in one of the bloodiest battles of the Pacific. In the tropics, Lane and his companions suffer malaria and dysentery, endure jungle rot and oppressive heat, and grapple with an enemy who fights to the death. Throughout the book, Lane bares the experience of the average Marine and his historic World War II journey, revealing how one teenager became a Corps hero and ultimately finished his military career as a lieutenant colonel. Kerry L. Lane retired from the Marines and is now the owner and operator of Post Oak Farm in Spotsylvania, Virginia. A powerful recollection of amphibious assaults and fierce jungle warfare from a hero of "Suicide Creek."